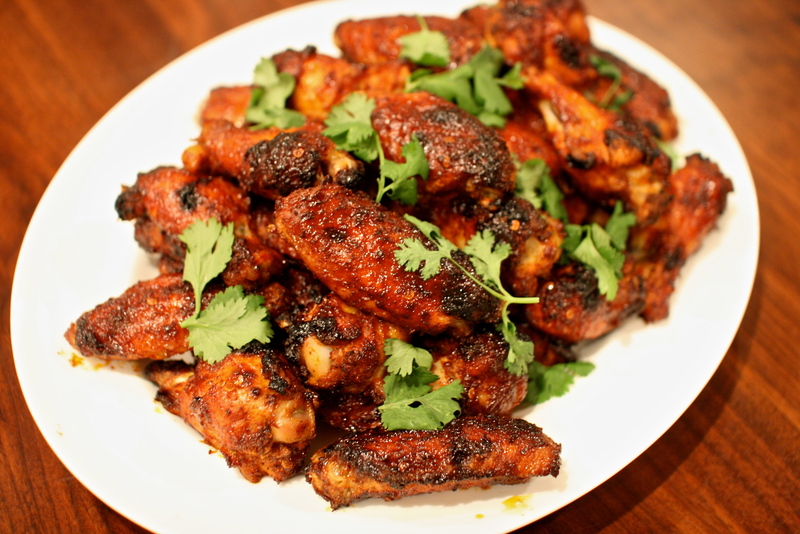 I stumbled upon the original recipe for these wings on the Serious Eats website. If you’re not familiar with it, you should definitely check it out. There’s always something interesting and a great recipe to try. Their Food Lab features articles on how to cook certain types of foods, with lots of tips and tricks. For example, they have a super helpful guide for “How to Grill a Steak“ and I found this article “In Search of the Best Oven-Fried Buffalo Wings,” teaching me that a quick toss in some baking powder and a little patience results in some damn good oven-fried wings. I’ve made both traditional Buffalo wings and these Chipotle wings using the baking powder technique. Success both times. This recipe called for the wings to be grilled, but because the article convinced me I could make the best oven-baked wings following their steps, and it was raining, I opted for the oven method. The result was sticky, smoky, spicy goodness. * I should be embarrassed to admit that I cooked 7 lbs of wings when I last made these, but I’m not. I’d also like to say there were 8 of us eating, but there were only 3. I doubled the glaze for the 7 lbs of chicken. We did have some leftovers. 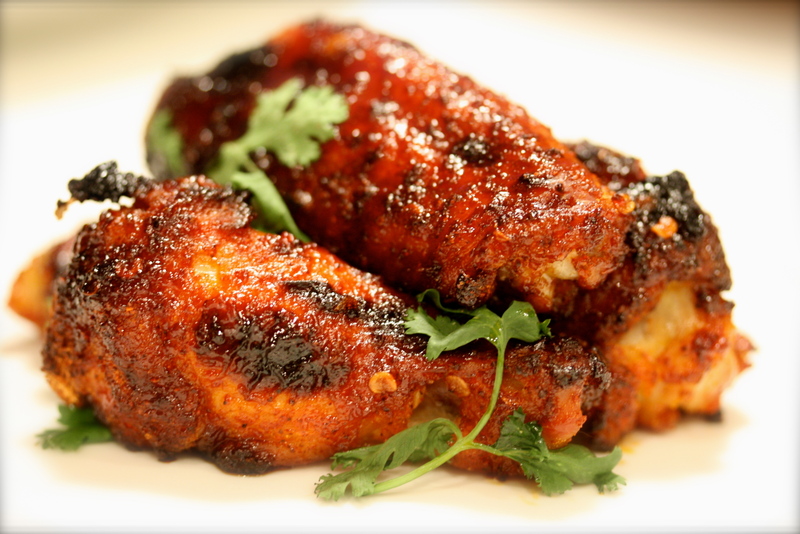 Line one or two rimmed sheet pans with foil, based on how many wings you are making. Set a wire rack on top of the foil. I use a metal cooling rack. Avoid non-stick wire racks. They can’t handle the high heat in the oven. Set the prepared sheet pan(s) aside. In a large mixing bowl, toss the wings with the baking powder, salt and chili powder until they are evenly coated. Place the wings in a single layer on the rack(s), preferably not touching. Refrigerate them for at least 8 hours uncovered. To make the glaze, place all the ingredients in the bowl of a food processor and purée. Transfer to a bowl and set aside. Bake the wings in the preheated oven. If using two pans, place one in the upper third and one in the lower third of your oven. Every 15 minutes flip and baste the wings with the glaze and rotate the pans. Continue until the wings are cooked through, about 45 minutes to one hour. Serve with chopped cilantro sprinkled on top and lots of napkins.